If you’re at San Diego Comic-Con 2018 this week make sure you head over to the Uglydolls booth #3245 to check out the first ever Transformers Uglydolls Plush! 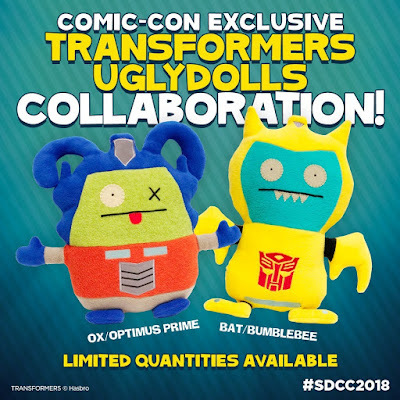 This epic, officially licensed collaboration between Hasbro, PrettyUgly and STXfilms showcases your favorite characters from the Uglyverse in Transformers Cosplay. Fans can choose from Ice Bat as Bumblebee or Ox as Optimus Prime! How rad is that!? !